Seattle's City Council has voted to not renew its contract with Wells Fargo, in a move that cites the bank's role as a lender to the Dakota Access Pipeline project as well as its creation of millions of bogus accounts. As a result, the city won't renew its contract with the bank that expires next year. The unanimous vote will pull the city's more than $3 billion in annual cash flow from the banking giant, the council says. Seattle says the bidding process for its next banking partner will "incentivize 'Social Responsibility.'" 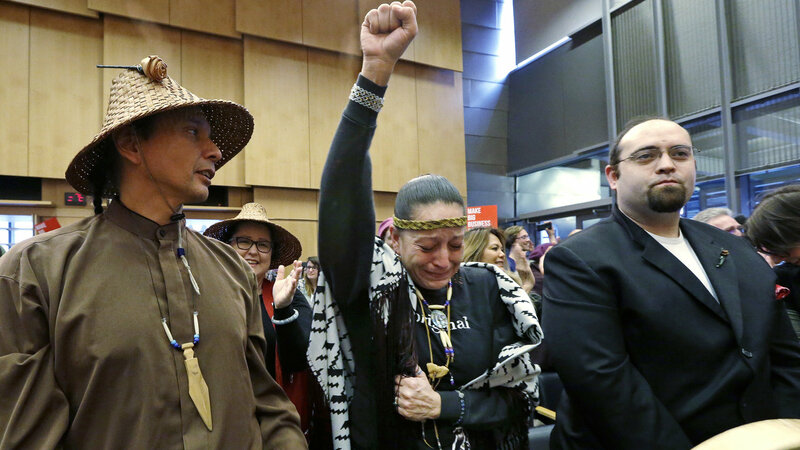 Not long after Seattle's vote, the City Council in Davis, Calif., took a similar action over the pipeline. It voted unanimously to find a new bank to handle its roughly $124 million in accounts by the end of 2017. On the same day the two cities moved to cut ties with Wells Fargo, the U.S. Army Corps of Engineers granted an easement allowing the Dakota Access Pipeline to cross under the Missouri River north of the Standing Rock Sioux Reservation. As NPR's Rebecca Hersher reported, that clears the way for construction of the final 1.5 miles of the more than 1,700-mile pipeline. Wells Fargo has been in the headlines since last fall over a scandal involving bank employees creating fake accounts in customers' names to bolster performance results and boost bonuses. While other banks are also involved in the pipeline deal, Wells Fargo's recent history seems to have helped make it a target once again. Days before Seattle held an initial vote on divesting from the bank, Wells Fargo announced plans to donate $500,000 to five of the city's nonprofit groups that work to revitalize Seattle neighborhoods. When Seattle Council member Debora Juarez spoke of voting against Wells Fargo, she repeatedly cited a need for integrity — even as she acknowledged the small direct impact Seattle's move will likely have. "For a company whose deposits totaled more than $1 trillion last year, it's a drop in a very big bucket," Juarez said in a statement. "But for Seattle, a City whose budget is approx. $4B., voting to withdraw our funds ... money that covers the biweekly payroll of $30 million for about 12,000 employees – is an opportunity to send a message."